Do you have a blog or website? Do you want to sell your blog or website to make money online? Well your answer can be Yes or No. In both situations you are right. It take efforts to create a blog or website and then establish it. You have to make you website ot blog popular with followers, subscribers and traffic before you can actually sell it in online marketplace. 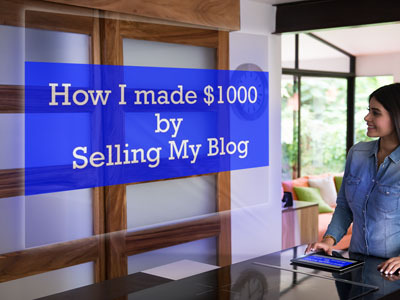 Today I am going to share about how I have sold one of my blog webtechland.com for $1000. I have started this blog just to share more about tech and also that I liked this domain name. I have created around 16 posts on different techs and started promoting it. This blog growed very fast and touched the Alexa rank of 500k within a month. I have started getting so many questions and queries about if I want to sell my domain or blog. I have got some offers which were not that much attractive. So I decided to wait for good offer and keep promoting webtechland.com. Last week Richa has contacted me and asked me if I want to sell my blog as she cna pay me good money. We had a little bargain about the price and then I have sold it for $1000 which is a really good amount for a blog which is just few months old. The very first thing which people usualy notice before buying a blog or website is its platform. As I have started this blog on Wordpress Self Hosted platform, people were more interested as Wordpress help you to edit and change anything easily. Everyone like custom domain name as noone want to have a long domain name such as demowebsite.blogspot.com or demowebsite.wordpress.com. Many people have contacted me because they just wanted to buy my domain on a good price, that shows that the domain name I have choosen have some good value in market. But I liked to sell whole blog rather than just selling the domain as that was more fruitful for me. The fastest growing Alexa Rank of webtechland has also helped me to sell it on a good price. It has touched the rank of 500k within one month so it was attracting many buyers. Alexa rank shows the popularity of a blog or website and this help you to ask for good price for your blog or domain name. Many a times I have seen that people just sell their blog or websites because they don`t want to keep them or don`t want to wait to increase their value. But I have waited till I got the best offer and this patience has rewarded with $1000 USD, which is a good amount. So In short any blog or website which has a good value, followers, good traffic and ranking can bring good amount of money for you. If you want to learn how to start a blog, you can join our blog consultancy service online or ask me. Do you have a blog or website? Do you also want to sell your blog or want to make blog or website? share with us. If you have any question, feel free to ask me.